"A surreal first person experience"
Ethereality is certainly an unusual game, it is billed as being set inside of a rave flyer and you can certainly see the influence, you play from a first person perspective and if we were to categorize the game, platform game is probably what describes it best but it is unlikely you have ever played a platformer like this! The world is full of bright colors and you can gain points by collecting what looks like little tablets as you go along, once you enter the world music will also start playing and it is advisable to wear headphones for a more immersive experience. Those who are familiar with 90's rave culture may get some flashbacks whilst playing Ethereality, and it is certainly a unique experience, it is not always easy as occasionally you will need to jump from one awkwardly positioned platform to another. 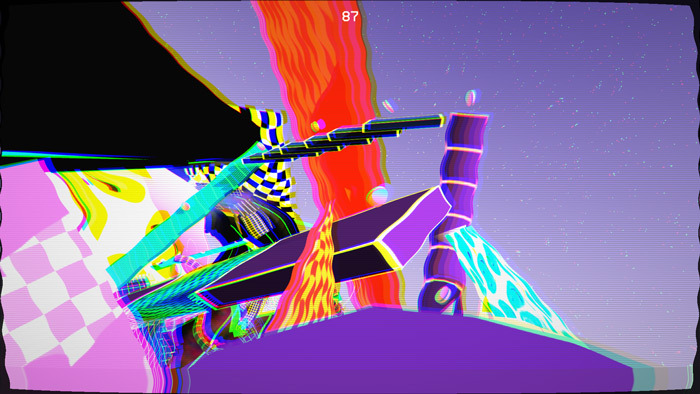 The game is bright and colorful however it also can feel a little bit unpolished and rough around the edges, at times it is quite hard to control your character from the first person perspective, but if you are looking for something a bit different and quite psychedelic then you could certainly do worse than checking out this game. 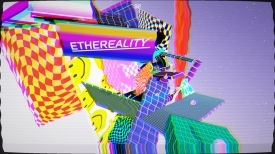 You can download Ethereality here for free.